shift-2 gives " instead of @, and shift-single-quote gives @ instead of "
The last one is the worst because I can't find any way to make the | symbol, so I cannot do some bash shell commands I need. Settings-Language says I am using English (United States), which I think is correct. 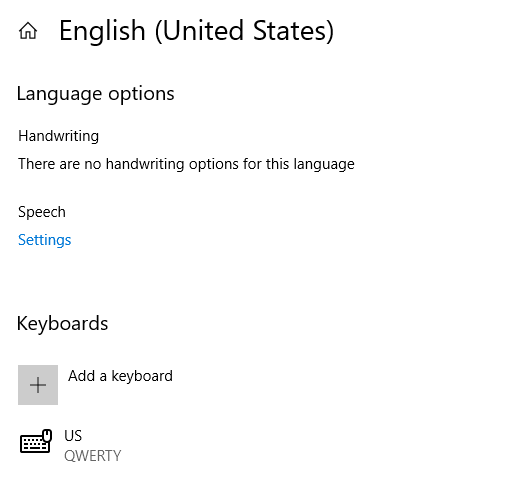 Settings-Devices-Typing-Advanced keyboard settings gives me only the choice between "English (Australia) United Kingdom" and "English (United States) United Kingdom". Either setting does the same thing. Or do I need to reboot after changing? Also the backslash key gives #. Which is good that I can make a #, but bad because I cannot make a \ . I can't find any way to make | or \ , other than go into an editor and cut and paste. 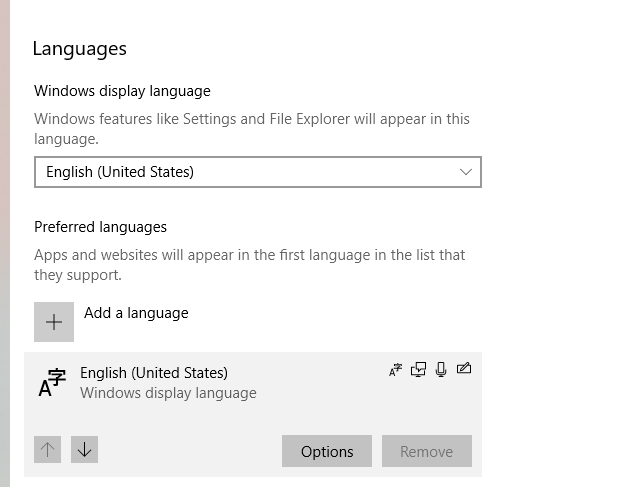 Under Time and Language -> Region and Language -> Preferred Languages, click on English (United States). Then, select Options, go to the Keyboards section and and add US (QUERTY). You can then remove the UK ones from here as well, by clicking on them and selecting Remove. You'll then need to reboot the machine for this to take effect. Not the answer you're looking for? Browse other questions tagged windows-10 keyboard international or ask your own question. Whenever I write an apostrophe it inputs two instead of one (same with quotes). How do I fix it?